Oh wow. Am I at the fifth in my watercolor flowers series already?! Watercolor flowers series #5: Bloom! I loved this Clearsnap stencil the second I saw it – I borrowed it from Jennifer and I think I snuck off with some mojo when I left the stencil behind with her! Well at least until I got to the card assembly. Watch the video to see how I solved the “unreadable” sentiment – that took me a bit to figure out! Check it out below or click HERE to watch in HD on YouTube. 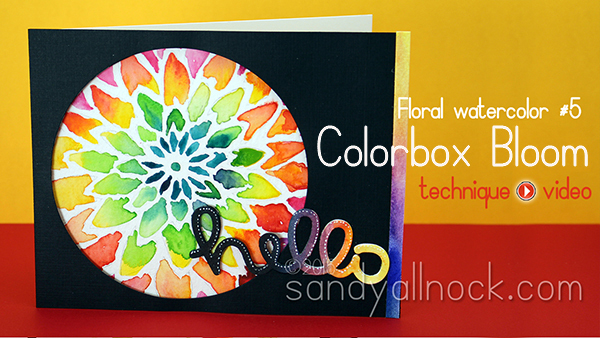 Once I had finished the flower, I came back home and made a card – but the design kicked my behind! I really really really struggled. The size of the flower was big yet detailed, and I was sad to cut off the purple petals, but I eventually found that the simplicity of the black frame really did set it off well. The contrast makes watercolor flowers look even brighter! I cut a strip of watercolor paper off the edge and painted it rainbow-style, and adhered it to the edge of the card. The diecut Lawn Fawn sentiment, diecut from two layers of watercolor paper, and adhered with this glue — it crosses the bright, busy floral and the plain black frame – to split the difference, I darkened the “h” and “e” so they’d show up on the flower. Check the dates on a lot of these posts, they’re old, when I was just starting with watercolor and before I discovered how much better I liked Daniel Smith and other papers. Love, LOVE! Broke down and bought the Gansai’s and love them! All the watercolors are a little different which is fun. Thanks for your wonderful instruction. Your card is just lovely! Thank you for sharing it, and your technique. Greatly appreciated. Thank you for sharing your process with us Sandy. It must have been a bit painful to chop off the outer petals, but this is completely lovely to look at. It’s so challenging for me to figure out how to solve problems but hearing how you finished your sentiment encouraged me! Always a joy to watch you create. thanks Sandy! So pretty!! I love that both the flower and the sentiment have a range of colors. Bright and cheery, not unlike yourself! Wonderful. Great way to make the sentiment pop.